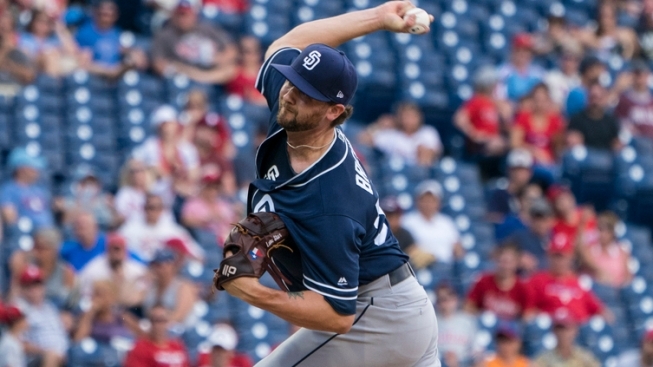 The Boston Red Sox acquired right-handed pitcher Colten Brewer from the San Diego Padres on Tuesday in exchange for minor league infielder Esteban Quiroz. Brewer, 26, made his major league debut with the Padres this season, making 11 relief appearances and allowing six earned runs while striking out 10 over 9.2 innings. Quiroz spent most of this season with Double-A Portland. •	The club has also requested unconditional release waivers on right-handed pitcher William Cuevas, who is expected to sign with the KT Wiz of the Korea Baseball Organization. •	Right-handed pitcher Austin Maddox was outrighted to Triple-A Pawtucket. •	Infielder Michael Chavis, right-handed pitcher Travis Lakins, and left-handed pitcher Josh Taylor were added to the major league roster from Pawtucket. •	Left-handed pitcher Darwinzon Hernandez was added to the major league roster from Double-A Portland. •	Right-handed pitcher Denyi Reyes was added to the major league roster from High-A Salem.